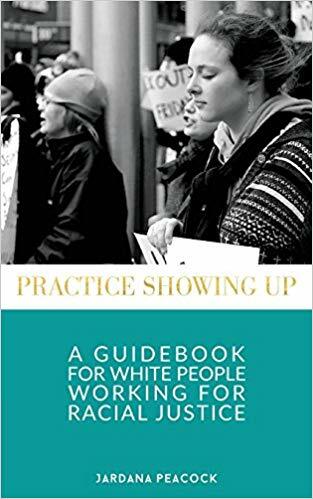 Practice Showing Up is a reckoning with white supremacy, a balm for the tensions of racial justice work, and a manual for white people to practice collective liberation. First conceived by author, healer and spiritual teacher Jardana Peacock in summer 2016, this guide gathers writing exercises, embodied and contemplative practices, poetry and artwork and weaves them with Jardana’s meditations from the front lines of struggle against white supremacy. The contributors are spiritual leaders, educators, organizers, social workers, writers, artists, and community members. With gentleness, power and humility, the author and contributors open up about the individual and collective rituals that have helped them or other white people resist white supremacy and practice making a better world. Virginia Rosenberg is a contributor to this book. The book includes practices, writing exercises, and lots of concrete resources for people who want to do the work in the midst of struggle. 70% of proceeds go to Spirit House NC and the Mystic Soul Project, two POC-led healing justice organizations.